I’ve learned a lot in The Energy Blueprint* about improving my Circadian Rhythm. (There are several introductory videos that are free, if you are interested in learning more about this program.) The program has several lengthy discussions on the benefits and issues with different light frequencies. The author, Ari Whitten, shares lots of scientific studies to back up his strategies. I certainly don’t understand all of what I’ve seen, but I have successfully used several of his suggested strategies. It didn’t take a program to tell me that improving my Circadian Rhythm was a top priority! I wasn’t sleeping much at all after my last sinus surgery. I was on high steroid doses for a month, so sleeping more than a few hours a night was unusual. So I started implementing strategies from the Energy Blueprint. I bought the blue blocker glasses to limit the blue light frequencies for several hours before bed. That way the lights in the house, and especially the TV light and computer light, were not signalling my brain that it was still daylight. I stopped using the computer and Kindle after 7PM. I bought room darkening drapes to get the room darker for sleep. And I’ve covered up with black electrical tape all the little blue lights that are all over the house. I bought a red light bulb to use as a night light in the bathroom. And we now use red light flashlights to navigate in the pitch black house to use the bathroom during the night. The red light does not stimulate the brain to think it’s time to get up. It’s more like the firelight our ancestors used at night. I saw a dramatic improvement in my sleep habits for quite a while after working on improving my Circadian Rhythm. But I’m sorry to say I’ve gone back to the old habit of waking up to go to the bathroom. That’s a problem for me, because I can’t get back to sleep.. At least I have more of an arsenal of weapons to get this terrible habit stopped again. I’m taking a Benadryl at night to help temporarily (NOT part of the EB program! ), and I’ve increased my daytime activity level as much as my muscles will allow at this time. I think part of the return of the problem is that it is getting harder to find a day when I can sunbathe. It’s now either too cloudy or too chilly on more days than not. So I’m using the RubyLux infra-red lamps in my make-shift sauna to try and make up for it. It’s obviously not working as well as the natural sunlight in improving my Circadian Rhythm and increasing my mitochondrial energy, but it’s better than nothing. The best way to accomplish this would be to use an infra-red sauna – but that’s out of our price range. I’m also using a 10,000 lux full spectrum light therapy box I bought on Amazon in the mornings now, even if I go outside and walk in the morning. Too often lately the sky has been so cloudy that I know I’m not getting enough of the blue light that signals, “It’s Daytime!” to my brain. And then the clock change hasn’t helped things, either. I’m struggling to stay awake at night until a decent bedtime, and that’s causing me to wake up earlier than I should. So I’ve kind of made two steps forward and one step backwards when it comes to improving my Circadian Rhythm. I’ll continue to add more of the EB strategies and hopefully get more of the many benefits of better sleep. You may find adding the Vit D light therapy Ari Whitten talks about in the program for people who can’t get enough sun in winter etc. I have just bought mine to start slowly using to top up my Vit D levels. It’s as good as the sun! I’m sure it would, Lucinda. But we’re on a budget, and the more expensive light system that Ari says is best will have to wait until next year. 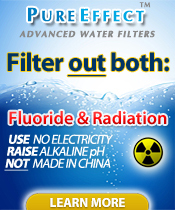 I chose to buy the water filtration system as my first big expense. Hubby and I will both benefit by reducing our toxic load. I’m not so sure I would ever get him to use the light – he’s shown no interest yet in using the RubyLux setup lol.